Unless you have lived in your home from the day it was built, chances are you don’t know how old the siding is. You are not alone. Your home’s exterior is the first thing others notice when they pass by your home and is a big contributor to curb appeal as well as your home’s value. If you are unsure if it is time to replace your siding, we’ve put together a list of six ways to know now is the time. If you notice that siding is starting to buckle, warp, or take on a different shape than usual, water is likely the cause. When water is able to seep behind the siding, it can cause two significant problems including rotting or mold and mildew growth. If you have wood siding on your home, dry rot is an unsightly fungus that is hard to get rid of. Some homeowners find success in replacing only the damaged area, but once it occurs in one place, it is likely to reoccur elsewhere. If you have dry rot, it is a good idea to replace wood siding with another, more durable siding material. Fading is a natural occurrence that happens to siding due to the amount of sunlight it experiences. Small amounts of fading are normal. If your siding has severe fading, it could mean it passed its lifespan and is not able to protect your home like it is intended to do. Siding is designed to protect your home from the various weather elements like sun, rain, and snow. In the northeast, this is especially true since we experience all four seasons. Holes and cracks in your siding allow water to seep behind it causing the boards to rot or mold to grow. With the freezing and thawing that occurs during the winter, it can also cause the siding to expand and retract creating larger holes and cracks. If you notice drafts inside your home in the winter or rising energy bills, faulty siding could be the culprit. Contact a siding professional to inspect the house and uncover if poor-performing siding is the cause. Mold and mildew growth can occur on the siding, behind the siding, and even inside your home as a result of outdating siding. If you notice mold growing inside, peeling paint, or bubbles on the walls, it is possible the damage stems from water leaking behind the siding. If you think it is time to replace your old siding, contact the professionals at Bealing Roofing & Exteriors. 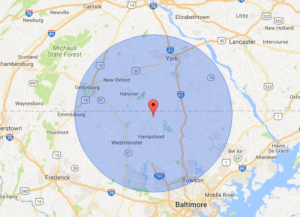 We have a dedicated team that travels South Central Pennsylvania and Northern Maryland for siding replacement projects.